You can view the procedures; change the ICD-10 codes; view patient, subscriber, and payer information; change billing and rendering provider information; change claim information; manage attachments; and update the status for a claim. The Procedures tab displays the associated procedures. For the procedures on the claim, the associated diagnoses appear. You can have up to four ICD-10 codes per claim. You can remove ICD-10 codes as needed (by clicking, or tapping, on the coresponding codes). 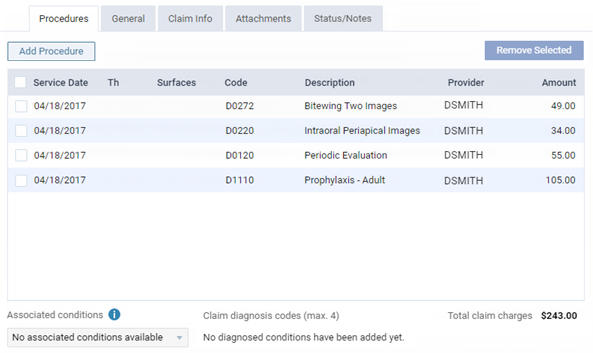 If you have less than four ICD-10 codes, you can add an ICD-10 to the claim by selecting a diagnosis from the Select a diagnosed condition list. Only the diagnoses attached to the claim's procedures (as currently posted in the patient's ledger) are available for selection. If there are two, three, or four ICD-10 codes, select the one that you want to be the primary diagnosis. The General tab displays billing and rendering provider information, the pay-to address, patient information, subscriber information, and payer information. You can change the Billing Provider and/or Rendering Provider. 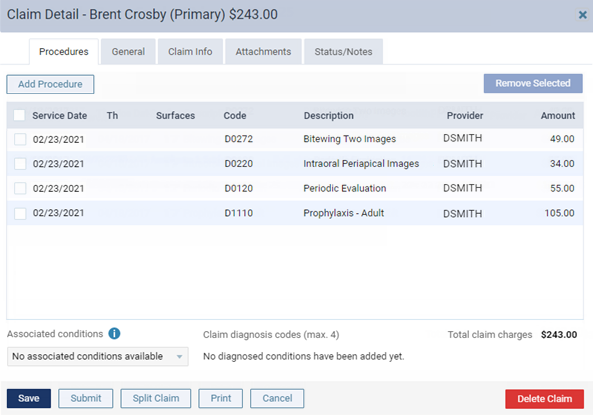 The Claim Info tab displays the name of the Referring Provider, the pre-authorization Reference Number, Orthodontia information (months remaining; and total months, the default value of which is calculated automatically, based on the placement date and remaining months specified, if the claim was created for orthodontic treatment), the Place of Service for the associated treatment, Accident Information (type, date, and state), and Remarks For Unusual Services (notes for the insurance carrier for this claim only). You can enter or change any of this information. Note: Only the first 80 characters of Remarks for Unusual Services are submitted electronically even though the box allows up to 151 characters. 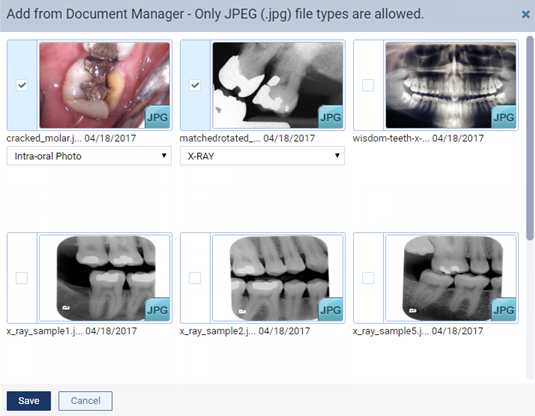 The Attachments tab, displays the patient's perio exam and the images from the patient's Document Manager that are attached. To add an image attachment, click (or tap) Add From Document Manager. In the Add From Document Manager dialog box, select the check boxes of the images that you want to attach, and select a classification/type for each selected image (if necessary, you can change the classification/type later by selecting a different option from the Classification/Type list on the Attachments tab). Click (or tap) Done. To attach a perio exam, click (or tap) Add Perio Exam to view a menu that lists the dates of the patient's perio exams, and then click (or tap) the date of the perio exam that you want to attach. To remove attachments, select the All check box to select all the attachments, or select the check boxes of the attachments that you want to remove. Click (or tap) Remove Selected. On the confirmation message that appears, click (or tap) OK. The image is removed from the claim but not from the document manager. The Add From Document Manager button is not available if the payer is a non-supported carrier (a carrier that was manually added to your practice database not from the list of supported carriers that Henry Schein maintains; it has payer ID of 06126). The Add Perio Exam button is not available if the payer is a non-supported carrier or if the patient does not have any perio exams entered in his or her record. Only .jpg/.jpeg files from a patient's document manager are valid for images that you want to attach to claims. You can attach only one perio exam to any given claim. 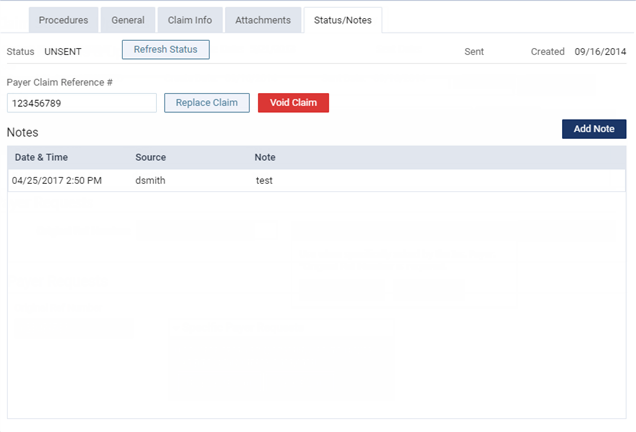 You can have up to a total of 10 attachments per claim. 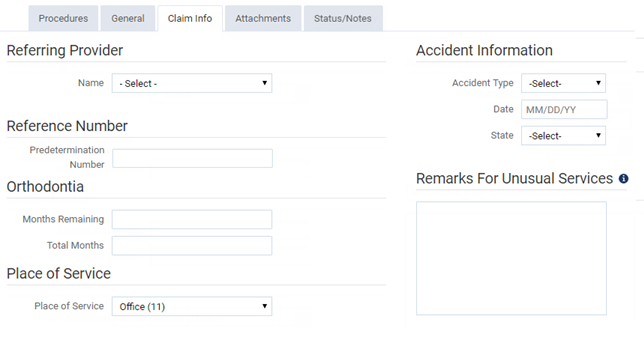 The Status/History tab displays the created and sent (if applicable) dates of the claim, the original reference number, and claim statuses. You can enter or change the Original Ref Number provided by the payer. Then, if necessary, under Specific Payer Requests, click (or tap) Replace Claim to resubmit the claim with the changes, replacing the original claim, or Void Claim to void the claim (enter a zero payment). You can access a resubmitted or voided claim from the patient's Insurance Claims page. Also, you can type a message in the Note field and then click (or tap) Add Note to add a custom status update. Some statuses are entered automatically, such as a status message with an NEA number if the claim has attachments. Click (or tap) Save and then Cancel to save and close the dialog box. Click (or tap) Submit to save the changes and submit the claim. Click (or tap) Resubmit to save the changes and resubmit the claim. Click (or tap) Print and then OK on the message that appears to create the claim as a PDF file that you can print.